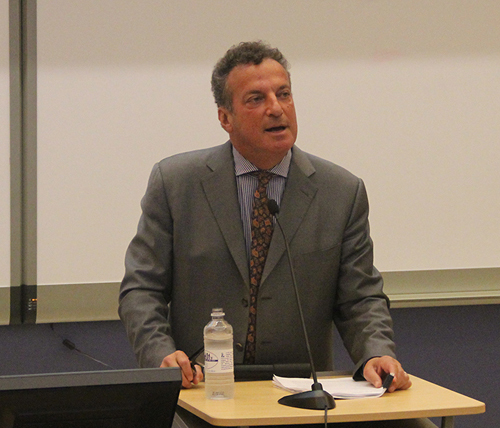 Jackson, MS—On Thursday, September 18, 2014, the University of Mississippi’s Center for Intelligence and Security Studies (CISS) and Jackson State University’s Cyber Security and Intelligence Program (CSIP) hosted an evening with Tim Weiner, intelligence expert, Pulitzer Prize Winner, and National Book Award Winner. The event took place at Jackson State University. Mr. Weiner, author of Enemies: A History of the FBI and Legacy of Ashes: The History of the CIA, presented “The FBI and Civil Rights: 50 Years in Mississippi.” At the Jackson event, Mr. Weiner spoke about the FBI’s role in combating the Ku Klux Klan in the state. This year marks fifty years since the Bureau established its Mississippi field office. In 1964, J. Edgar Hoover opened an FBI office in Jackson following the murders of three Freedom Summer civil rights workers in Philadelphia, Mississippi. Following his presentation, Mr. Weiner signed copies of his books. Mr. Weiner is a New York Times journalist and leading expert on the FBI as well as the intelligence community. As an investigative reporter at the Philadelphia Inquirer, Mr. Weiner received a Pulitzer Prize for his coverage of black budget spending by the Pentagon and the CIA. His 2007 book, Legacy of Ashes, received the National Book Award and changed the historical narrative surrounding the agency’s history by detailing its controversial (and at times, illegal) actions. In 2012, the UM’s CISS and JSU’s CSIP received a grant to establish an intelligence consortium as part of the Office of the Director of National Intelligence’s Centers for Academic Excellence. Both UM and JSU offer courses in intelligence analysis to prepare students for future careers in the security sector.